Casa Roble Hostal Boutique has a comfortable lounge where complimentary breakfast, which can be used by guests during their stay is offered. As the kitchen is to use passengers where they can find a refrigerator to store what food to bring Hostel.We have a beautiful patio to relax or maybe read a good book on the return walk through the city of Santiago. With the perfect location, comfy beds, spacious and decorated common areas and an efficient staff. Casa Roble Hostal Boutique is located in the commune of Providencia Street Viña del Mar, Santiago de Chile near us can find the Bustamante park , Cerro San Cristobal and Barrio Bellavista, these three points are of great interest within the city of Santiago and everything is within a few minutes Casa Roble. Surrounded by restaurants, bars, supermarkets, Casa Roble is the ideal place to spend a few beautiful and peaceful days. We have dormitory rooms, female and male, for 6 people each or 8 people, they are equipped with bunk beds, clean sheets and blankets. The hostel provides warm clothing if it is necessary, we also have lockers in the rooms and storage if is necessary. We also have options of private rooms, one for two persons is equipped with a bunk bed, cable TV in the room and a private bathroom with shower. And finally we have a double or triple room, with cable TV and private bathroom. All private rooms are equipped with sheets and towels. 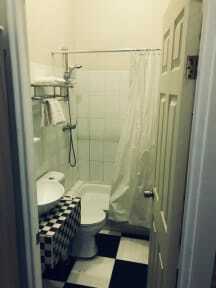 Nice hostel, good location, amazing showers, nice and clean rooms. Wifi works only in common area. But the rest of the hostel is very nice so that's ok.